Blog › Marlin Knife - Colours! 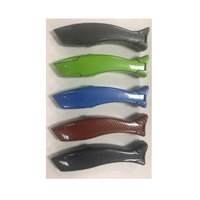 The established Marlin knife is now available in five different colours – simply choose from “BRIGHT BLUE” / “CARBON NAVY” / “DEEP RED” / “BRIGHT GREEN” / “CLOUD GREY” - or choose all 5! They feature a really high-quality polished finish, each supplied with plastic holster. For Janser Distributors the knives can be supplied in an attractive trade counter Display Box containing 20 knives (4 of each colour) and special quantity discounts are available. To find out more about our colourful Marlin knife range, simply select the link and submit an enquiry today. Make sure you're correctly equipped for any flooring project. If you're looking for a comfortable, ergonomically designed knife, this reliable brand has the perfect solution - in the colour of your choice! Remember: Visit us in the New Year at Domotex 2018 in Germany, renowned as Europe’s largest flooring industry show – a ”must attend“ event. It will give you a chance to see our new product range, at our large stand displaying all our latest developments in floor preparation and floor installation machines and tools. We look forward to meeting any UK visitors to the show on our stand - drinks and refreshments available! Janser would like to take this chance to wish all our customers a very Happy Christmas and New Year – and we look forward to bringing you further exciting additions to the vast Janser range in 2018!